After an exciting Judges’ Auditions phase, the power now lies in your hands! The top 24 acts are through to the semi-finals and you can start voting for your favourite acts this Thursday evening. To vote, tune in to Asia’s Got Talent every Thursday at 8:30pm, and wait for the hosts to announce that voting is open, then go to Facebook or Google to start supporting your favourite acts. In each semi-final episode, eight acts will perform. At the end of each episode, the act that impresses the judges the most will win the Judges’ Pick and head to the finals directly. The seven remaining acts will be up for voting, and the two acts with the most votes after the voting period closes will head to the finals. The voting period will be open for four days from Thursday evening, when the hosts announce that voting is open, to the following Sunday at 11:59pm. During the episode, each act will be assigned a unique voting hashtag. Fans can vote for their favourite act by using that unique voting hashtag on their Facebook page or via a Facebook comment. Each post or comment may include only one unique voting hashtag. Fans may post votes for 10 unique and/or same act per day on 10 different postings throughout the voting period. Fans can vote via Facebook Messenger by clicking ‘Message’ on the Asia’s Got Talent Facebook page, or search for Asia’s Got Talent in Facebook Messenger. Click "Get Started" and you will see a photo carousel of the acts eligible for voting. Scroll through the carousel until you see your favorite act, then click to vote. 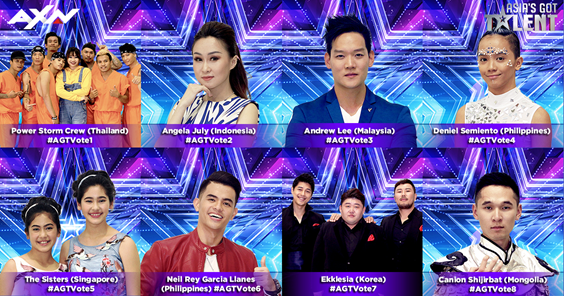 Fans can vote for their favorite act by searching for “Asia’s Got Talent Vote” on Google. Simply click on the photo of the act you would like to vote for, use the slider to determine how many votes you want to allocate to the acts and click ‘Submit Votes’. You can allocate up to 10 votes per day on Google Search. Asia’s Got Talent is supported by presenting sponsor Traveloka, the leading travel booking app for all flight and hotel needs; sponsoring partner Great Eastern Life, the market leader in the conventional life insurance business and the largest life insurer in Malaysia by asset size; and GoDaddy, the world's largest cloud platform dedicated to small, independent ventures.